If fresh hop shoots and fiddleheads are not available at your local grocer, morel mushrooms and English peas are suitable replacements. 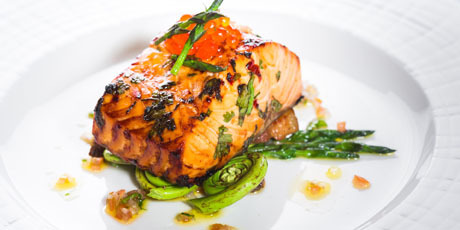 You might also like these Fantastic Ways to Cook Salmon Fillets. 2. Marinate the salmon in the glaze for 10 minutes. Remove salmon from marinade and place on a baking sheet lined with parchment paper. Bake at for 10-12 minutes. 3. While the salmon is cooking, blanch the hops shoots and fiddlehead ferns in salted boiling water for 30 seconds. Remove and quickly place them in a warm sauté pan. 4. Lightly sautée the vegetables with all the remaining ingredients, except for the salmon roe, for 30 more seconds. Season with salt to taste. 5. Remove salmon from the oven and allow to rest for 3-4 minutes. 6. To serve, arrange sautéed vegetables onto two plates and place the salmon on top. Use the lightly sautéed herbs and tomato to drizzle around the pate. Garnish the salmon with the maple-cured salmon roe. Recipe courtesy of Sidecut Executive Chef Tory Martindale. Image courtesy of Four Seasons Whistler.